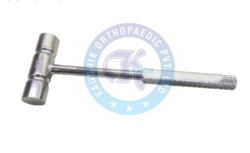 Kaushik orthopaedic corporation is the most reputed manufacturer of Hammer with Fibre Handle, it is an orthopaedic tool which is used in medical science for treating patients. It comes with a fibre handle for extra comfort and a better gripping. These are made up of stainless steel, thus these hammers do not corrode. Our instruments are accurate in design and precise in dimensions and are widely acclaimed for their quality and optimum utility for medical application. We are enlisted as a leading manufacturer and exporter of SS Hammers that are fabricated using premium grade raw materials and latest technology methods. Their non-corrode nature, stainless steel and unmatched quality make them widely appreciated by our valued clientele all over the world. 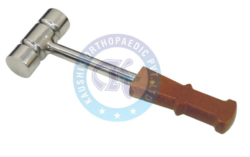 Apart from this, our range of these hammers is known for their smooth finishing, anti-corrosiveness, and durability.